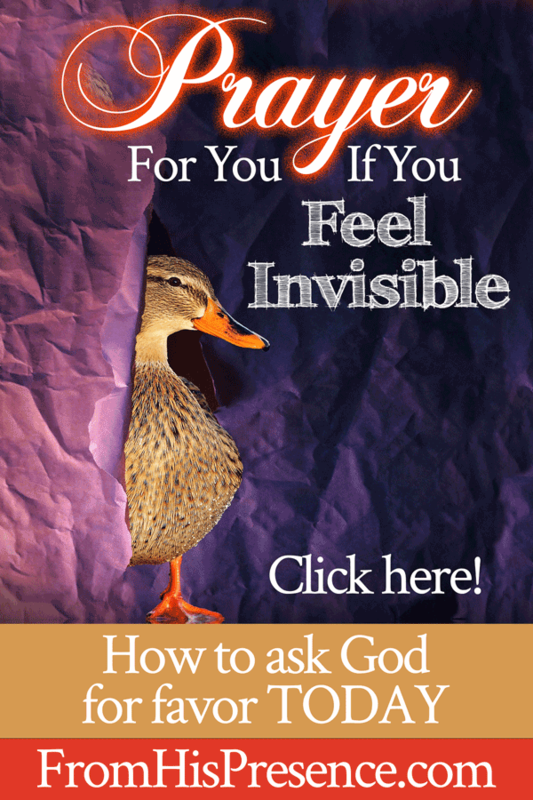 Beloved, do you feel invisible today? If so, I believe the Lord wants to break that hiddenness off you today and flaunt you to the world. It’s true that God raises people up in hiddenness. He turned David into a mighty man of valor on the back side of Bethlehem while David was tending sheep. Long before David ever made it to King Saul’s court, he was known as a mighty man with the sword and the harp. God raised David up to be strong before He ever got David away from the sheepfold. But then, a day came–and God flaunted David to the world. God raised Joseph up, taught him, and discipled him during those long years of rejection at home with his family. His brothers hated him and sold him into slavery. Then, Joseph had a momentary glimpse of favor at Potiphar’s house–only to be falsely accused and subsequently thrown into jail for many years. But when due time had come, God took Joseph from the pit to the palace in one day. God may take His time; but when He promotes, He promotes quickly. I believe that right now is God’s time to promote many people in His family. If your heart and spirit are crying out to God as you read this, I believe it’s His time to promote you in some way too. You’ll be joined together with what you’re supposed to be joined to. God Himself will take delight in you. His delight will be obvious to others. You will be chosen, selected, and honored. I believe it is God’s time to honor you. Many of you have been feeling dissatisfied with where you are, yearning for something better. You’ve been praying a long time for favor, opportunities, and relationships. You’ve been seeking God with all your heart for His face, not just for His hand. However, you’ve also been praying the prayer of Jabez–that He would bless You indeed, enlarge your territory, that His hand would be with you–for so many years as well. You’ve been believing God for bigger and greater–and You know He will come through. Yet, all this time, you have watched yourself be passed over time and time again. Favor and opportunity have been fleeting when they have come. You’ve been grateful for all that you have, but your heart yearns for more. You know God has promised you more … but nevertheless, it’s as if you’ve been hidden from sight. Your heart has been broken more times than you can count, but you still believe God. The travail has worn you out, but you still believe God. You stand firm in faith, and you have forgotten how to cry. But beloved, I believe the pressure you feel right now is the final push–and that God wants you to pray in His ultimate breakthrough. I believe you feel such agony and groaning in your spirit because God needs you to push through one more time. In order for this breakthrough to come, you need to push. Will it be the last time you’ll need to contend? Of course not. But this strung-out-in-contending feeling you’ve been having is the birthing pangs of God’s destiny for you, and He needs you to pray in His promotion. It’s time for your land to be married, and for the veil of invisibility to be torn from top to bottom by His mighty hand and outstretched arm. Are you ready to be promoted? Father, thank You for loving me. You are good, and I thank You for it. Your mercies endure forever. Thank You. You loved me and knew me before the foundation of the earth. I am Your inheritance, Your precious possession. Thank You. I am Your child, and You cherish me. Thank You, Father. I need Your love, and am grateful for it. I rest in You, and I take comfort knowing who I am in You. But Father, I feel invisible here on the earth. Lord, I reject and renounce the evil spirit of self-pity and all of its manifestations. I choose to remain thankful, keep my eyes on You, and give thanks to You instead. You have always taken care of me, and You always will. You also said to cast my cares upon You, for You care for me. You said that I should be anxious for nothing; but in everything, with prayer and supplication, with thanksgiving, that I should make my requests known unto You. You said to pray without ceasing. You said to ask for what I want, and that I would receive when I ask–that my joy may be full. So that’s what I am choosing to do right now, Lord. Father, I have been overlooked in many things for a long time. People who have been choosing haven’t chosen me. People who have been looking haven’t seen me. Other people seem to get opportunities, but I have gotten very few. It’s been like I have been invisible and forgotten about by the world. Father, I know that You sometimes hide people until the right time. I know that You raise people up in obscurity and then flaunt them to the world. Your Word says this. You did it with Jesus, hiding Him 30 years in Nazareth. Then, You suddenly flaunted Him to the world at His baptism and again at the wedding in Cana of Galilee. You also did this with David, Joseph, Elisha, Moses, and others in the Bible. But Lord, I also know that You can’t move unless I pray. So Lord, even though You raise people up in obscurity, I’m asking right now for Your help–that You would remove me from obscurity and reveal me to the world for Your glory. Father, I ask in Jesus’ name that You would debut me to the world. That You would remove the veil of invisibility that has been on me. Break off the thing that has kept people from seeing me for who I am in You. Break off the thing that has made me be overlooked for opportunities, promotions, and favor time after time after time. Accelerate the timing of my promotion and bring it into the NOW like You did for Jesus at Cana of Galilee. Work a miracle and bring me out into the open for the sake of Your glory, so that I can fully function in who You made me to be on the earth. Father, You are good. My times are in Your hands, and I submit to Your timing. However, I believe that my time is now, and that You are asking me to pray this way so Your Kingdom can come and Your will can be done on earth, and in my life, as it is in Heaven. So Father, turn Your spotlight of favor on me for Your glory. Let me be chosen instead of overlooked. Let Your spotlight of favor shine brightly upon me. Let opportunities, increase, favor, and promotions come to me from every side. According to Your Word in Isaiah 62:4, let me be a Bride who is chosen, selected, and sought out. Send me the kings who are to be my foster fathers, and the queens who are to be my nursing mothers. Send me my sons and daughters from afar, their silver and gold with them. Send me my children from the ends of the earth. Let miracles of favor come forth for me today in Jesus’ name. Let miracles of money come forth for me today in Jesus’ name. Let miracles of opportunity come forth for me today in Jesus’ name. Let miracles of relationships come to me today in Jesus’ name. Let miracles of influence come forth to me today in Jesus’ name. Let miracles of healing come to me, my body, my soul, my mind, my spirit, my family, my finances, my ministry, my job, my children, and every other thing pertaining to my life–in Jesus’ name. Lord, let me no longer be forsaken or desolate, but let me be sought out. Shine Your light of favor on me today. Increase my anointing, FAVOR, and influence on every side for Your glory. I decree that people will come running after me beginning TODAY and every other day, carrying with them favor, opportunity, and promotion. Lord, promotion comes from YOU, so I’m not going to seek it from people. But, I know You use people to do Your will; so I thank You that YOU are sending the people with the blessings, favor, opportunities, and promotions to me right now in Jesus’ name. And Father, now more than ever, shore up my knowledge of who I am in You. Help me to rest in You. Help me to know that I know that I know who I am in You. Teach me more about Your call on my life. Reconfirm Your promises to me and my family. Help me to stand with Your armor on; and, having done all, to stand some more. Thank You, Father. Let the answers come for Your glory; for Your honor; and for Your praise. Let Jesus be lifted up in my life; use me to make His name famous on the earth. Does this word resonate with you today? If so, leave a comment below and tell me what the Lord is saying to you! I am blessed with this prayer. WOW..( I cried the whole time while reading) for just a hour to checking my email before heading to work, I prayed to God for the same things! you just delivered his answer’s to me) I am so beyond words to say! You’ve confirmed what I’ve been praying for a sign to be delivered to me just a couple of days ago! I thank God everyday for you Jamie, I’ve been with you for the past 2 years and I can honestly say you have saved me a lot of time prophesying right on time when I need confirmation from our Father! I love you and I pray God with keep using you to help(us) your spiritual family by using your gifts to uplift the hurting, lonely, broken-hearted, etc on all levels! Wow! Amen! So glad Papa blessed you! Thank you for being part of this family, Cathy! This prayer was precisely what i was seeking from God. I have been feeling ignored and undervalued. As I read this prayer towards the conclusion I drifted off in sleep and I had this flash of two girls fighting very seriously and I noted that am one of the girls. So I prayed against powers that has caused me to be hidden. Am happy to have prayed that prayer. I have greater and better insight on the subject about hiddeness. This Word is confirmation for what I prayed for yesterday. PRAISE YOU LORD! THANK YOU FOR NOT FORESAKING ME JESUS. Thank You so much for sharing this Prayer. It means so much to me in my life might now. There are no words to express what this prayer has done and will continue to do for me. Thank you Jamie, for this wonderful blog post! This helped me so much. God has given you a gift to encourage his people and I pray that God would continue to use and bless you mightily in His precious name. Amen! Thank you, beloved! So glad it helped! Thank you Jamie! This was right on time. Praise the Lord! Amen. I woke up this morning and I confessed to God that I felt unseen in this world. Shortly after arriving at work, I received your email about this post. It assured me that God does see me and I am never forgotten. It also assured me that God does understand and hear my prayers. This was the confirmation that I needed. Wow, praise God. I love how He works like that! He sees you right where you are and loves you so much! Thank You, Jesus! Amen, I receive this in Jesus name. Bless you & Thank you, Jamie for writing such a powerful prayer to submit to our Father. It is so timely in my life as I am returning to the workforce and just left a new job after only one month due to the very negative environment where I found myself becoming more and more depressed despite my positive attitude and friendliness. I left before finding another position because I could not take another day. I have applied for another position at a company that truly values their employees and customers and who promotes exceptional customer service and team building. I feel that it would be a great blessing to work for them and am awaiting a call back for a potential interview. I also can relate to being rejected and excluded, but by my sisters which has been very painful. I pray for my family frequently — for God to reveal Himself to them and for Him to bless them and watch over them. At the same time, I pray for our Father to acquaint me with those whom will see my value and appreciate my gifts and also with whom I may build healthy and loving friendships with. I know He is with me in the meantime and that I need to continue to pray and to trust His timing. Streams of tears are flowing right now as I read this much needed prayer!! I also cried all the way through the prayer at the end of this devotional. It seems that everywhere I turn I’m hearing or reading about Joseph, David, Moses…about the preparation time, the crushing time that produces the oil. Thank you for sharing this devotional, it really ministered to me. God is so faithful, Truly he’s not a man that he should lie. I have been praying asking God for the same thing you posted. I have no words! I just finished praying, then l decided to check if I had any emails & I thank the Holy Spirit for guiding me to the answer. May the lord bless you Jamie mightly & continue to increase your gift of prophecy. You alway send the message at the right time when I need it most. Thank you for Father God that you never leave me or forsake me. Thank you Lord that you are close to the broken hearted and saves those who are crushed in spirit. Thank you Father, thank Jesus and thank you Holy Spirit. . Amen and Amen. So timely, I can’t believe just how timely, for I’ve been praying for all of the above. I receive everything you have said, that which our Lord has revealed to you. May the Lord give you strength to keep going and to keep relaying His wisdom to you, so you can continue to help us. God bless you in your life’s journey. Thank you for this message, it is exactly what I’ve been praying for. Wow! This prayer is powerful! I felt the power and the heavens open above me! I receive every word with expectation! Thank you! Thank you so much for this prayer, it’s like you saw my heart and felt what I been going through all my life. I felt I always over look in everything. Even in my church, I remember they were giving out awards of appreciation to the workers in the kingdom, even though I am one of the kingdom work who leave last on Sunday after finish making sure everything is done. I was the only worker name that didn’t call out to present my award, until the next Sunday, because some ask what happens to my award. The explanation was they couldn’t find mine, but it was ordered. I will pray this prayer every day until the spirit of hiddness bind up and the spirit of God loose and to locate me. My heart desire. What a blessing, and I receive those beautiful words that resonate with my heart. Thank you – God bless you for letting God use you. Jamie you are a life saver! Hallelujah! Thank you Father, thank you Jamie. It is done, in Jesus name AMEN!!! I have just prayed and i believe God will do something in my life.How about praying if you feel like you are are put in a bottle…like going around and round in cycles?What prayer can i pray? thank you so much for these prayers, Jamie. I have felt invisible, overlooked and forgotten for several years. I declare that today all of that changes and shifts and I will no longer be forgotten, but sought out! my husband and I both! and thank you Lord, for what you will do in our lives for Your glory. Amen! This prayer came right on tine. I feel so left out and over looked. I feel as though I am stuck in the wilderness season, seemingly. I prayed this prayer aloud and I believe every word. Now I await the manifestation of His glory to be revealed. Thank you and God Bless! Thank you Jesus and thank you Jamie. This word spoke to my heart and with such confirmation. Been feeling this way for a while and praying this prayer with you went with my prayer time this morning. I receive it for me and my son(who needs such a blessing right now and connection to the right people) in Jesus name amen!! Hallelujah! Thank you for being obedient and sharing this on-time Word and prayer. It has encouraged my heart and strenghtened my faith and trust that God is working it all out for my good. God bless you. Keep on allowing the Lord to lead you and being obedient to His will. God Bless You! I needed this today! Started my day feeling at a loss for energy. On the verge of a promotion but it is still so quiet. This prayer has given me peace. God bless your ministry. Wow right on target thank you! Expecting now! Yes Jamie. Thank you for the perfect timing and perfect word. Thanks for this word that gives strength and help at this time of transition. God bless you for your faithfulness to those who going through a tough time! Thank you so much for this prayer, Jamie. I pray this prayer for my myself and all that have prayed this. I believe and receive it, for the best is coming NOW, in Jesus’ name, AMEN! Yes! This prayer resonates in me constantly. Praise God! I RECEIVE THE WORD OF PRAYER! Thank you so much! I prayed this prayer out loud to the Lord to hear myself say it and ask it to him. Father do it! No more last, but first in Jesus name! Blessing!